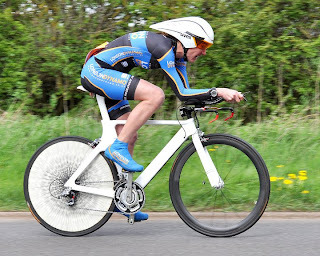 The league had its first of two time trials at the end of April - the Addiscombe 25 mile Time Trial at Broadbridge Heath, near Horsham (aka G25/53). Once again we had a record number of women at this race, with 23 starters. Although the rain came down part way through the merry-go-round course with all its roundabouts, this didn't dampen the spirits of the racers and there were still a number of impressive times achieved. London Dynamo's Rebecca Slack just dipped under the hour, while Maryka Sennema (Kingston Wheelers) crossed the finish line just over the hour. Not long afterwards were a number of women who clocked 1 hour 5 minutes, including league leader, Elise Sherwell (Pearson Cycles). The great thing about this event is that many women were taking part in their first ever time trial, and judging by their reactions they'll be back again for more. The other league time trial will be in Richmond Park 8th August. If you can't wait until then, there are many time trials taking place in the region. Check out the Cycling time trials website for more information. Travelling from Jersey to the UK for a race, taking the quickest route possible involves flights, hire cars, hotels, bike boxes and bike building and dismantling. But it's worth it to get on a start line with so many women cyclists. The Addiscombe TT was superbly organised, thank goodness. There were so many marshals who did a fantastic job pointing me in the right direction, as on paper it was quite a confusing course! The hot tea and cake after a cold wet race was just what Kim (Ashton) and I needed before packing up and travelling to the Airport. We had a fantastic time, everyone was so friendly and helpful we can't wait until we can come over for another race. I have to add I am just loving the London Women's Racing League. This year is the first time I have ever entered women's races, and I find it really different to racing with men. You can do a bit more than just hang on for dear life! I chose this event because of it's similarity to the cycling part of a triathlon race. The distance and riding alone (no drafting) were completely appropriate for my training this year and a good way to measure my progress. I was a little bit nervous while getting ready in the car park but otherwise settled by the time I got to the start line. I can't say I had any real strategy. Keeping an eye on my computer and monitoring my speed kept me motivated to push a bit harder on the long slow gradients. Despite the pouring rain, the pain in my legs on the gradients and coping psychologically with one more roundabout when I thought I was turning onto the home straight - I did enjoy it. And I would like to take part in another time trial. I did the time trial because I am new to cycling, and this seemed a little less daunting than pack racing. Also as I was doing my first triathlon of the season the week after this was good practice for that. My strategy was to keep a steady cadence and finish comfortably. I enjoyed it and will do more. Maybe I'll study the map in advance next time! Lining up at the tail of the 23 strong ladies’ field for the Addiscombe 25 felt really special and being last off I was able to witness the anticipation of the large number of debutantes as they set off on their first “race of truth”. All week, the weather forecasters had been predicting it would be the hottest day of the year, potentially wreaking havoc for marathoner runners. Meanwhile, I was secretly pleased at the prospect of a warm “float” day - conditions which typically lead to fast times for time triallers. In the event, the rain started as I did, and predictably stopped when I reached the finished! The inclement weather made for some testing conditions out on the course given the vast number of roundabouts that need to be negotiated at speed and the three dead turns. Compared with other courses I have ridden, it felt hard to get into a rhythm and required much greater concentration than normal because of the poor visibility and large number of road junctions. 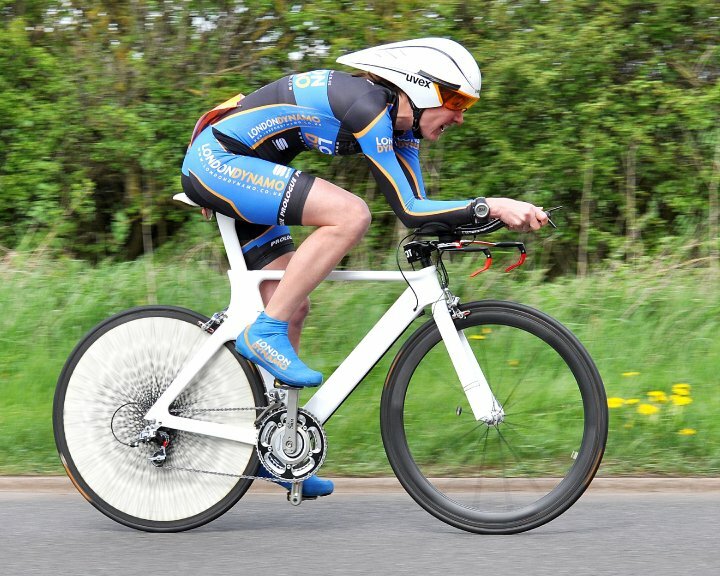 However with all of the race on a dual carriageway, I knew it was possible to "go under" (a sub hour 25 in TT slang!) and I set my goals on ensuring my average speed was above 25mph throughout the race to achieve that. As I emptied the tank in the slight up-hill run to the finish, I knew I had achieved my goal and was pleased with my 59:08 ride giving an overall victory in the ladies’ category. However, I can’t help thinking that the real winners were the large number of first timers who achieved PBs in the race. Here’s hoping we see all those riders at another time trial some time soon.